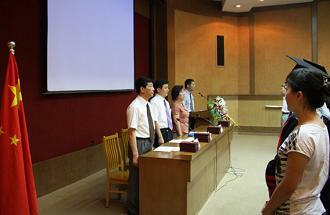 In the morning of July 10, 2009, the Post-graduate School graduation ceremony of year 2009 of the Shanghai Institute of Organic Chemistry was held in the reporting auditorium of the library of the Shanghai Institute of Organic Chemistry. The Secretary of the Party Committee Jia Jingfang, the Deputy Director Ding Kuiling, Academician Lin Guoqiang, the Director of the Advisory Committee of the Shanghai Institute of Organic Chemistry, Researcher Ma Dawei, the Deputy Director of the Advisory Committee of the Shanghai Institute of Organic Chemistry and Post-graduate Supervisor and all the Doctors and Post-graduates of the year 2009 and their housemasters and relatives and friends attended the graduation ceremony. The ceremony was presided by Researcher Ma Dawei. 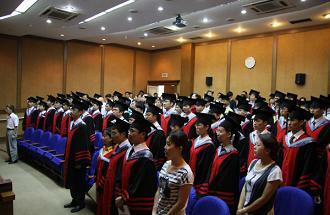 The graduation ceremony began in the majestic national anthem of the People's Republic of China. Gao Xiaolan, the Director of the Post-graduate School read out the list of the 58 doctors and 13 post-graduates that were rewarded with the degrees in this summer. The graduates were full of joy, and in the yare march, they accepted the graduation certificates issued from hands of the Secretary of the Party Committee Jia Jingfang, the Deputy Director Ding Kuiling, Academician Lin Guoqiang and Researcher Ma Dawei. 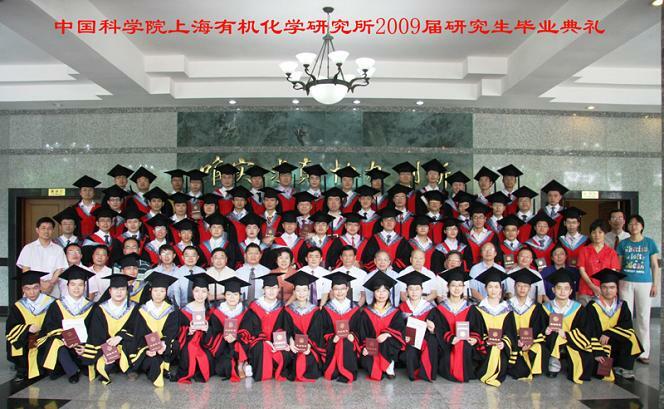 In the ceremony, those received Shanghai Municipal and CAS Systematic Outstanding Graduates and "Three Goods" Students and "Three Goods" Student Pace Makers in the year 2009 were carried on with commendation and awarding. The Deputy Director Ding Kuiling gave a warm speech. On behalf of the leadership of the Shanghai Institute of Organic Chemistry, expressed sincere congratulations to all of those graduates that were about to go to work or for further study, and expressed heartfelt thanks to the teachers and parents who hardly cultivated the students. He hoped all the graduates to firmly establish the faith of serving the motherland and the society, to adhere to the spirit of science of "be realistic, for the truth, co-operation and innovation”, to promote positive and optimistic and indomitable style of work, to make great ambitions, to be brave for innovation and strong physique, to continually pay attention to the development of mater school after going into the society, and to make contributions to the times for the country's prosperity and national rejuvenation! Student Ren Guobao made a moving speech on behalf of all graduates of the school, sincerely expressed their love to the mater school the Shanghai Institute of Organic Chemistry, and their thanks to their families and friends, and their good-bye love to their own schoolfellows! The graduation speech fully demonstrated our institute’s post-graduate students’ good spirit and excellent quality. Doctoral Supervisor, Researcher Hu Jinbo made the speech on behalf of the Supervisors, expressed the deep benedictions and ardent wishes to the graduates of the year 2009, he shared four points of his personal experiences with all the graduate students, through which received the students’ recognition and a long round of applause! After the end of the graduation ceremony and degree awarding congress, all graduates took photos with the leadership and Supervisors for memorializing.